One of the hazards of rearranging books is that it is nearly impossible to pick up a book without opening it and reading a bit. This may be pleasant and instructive, but it does rather slow the process down. Wow, December already. For those of us who are really insistent on the meaning derived from etymology, this means it's the 10th month, right? Haha. As sometimes happens, I found this week's new-to-me word because all of a sudden it seemed like it was popping up everywhere. (This is sometimes known as the frequency illusion or the more colorful Baader-Meinhof Phenomenon.) The new word is ultracrepidarian, which is an adjective or noun for someone who opines on subjects outside their area of expertise. I first saw it because the Twitter user Edward Banatt uses the term as part of his profile. Since he presumably wrote his own profile, we have to assume that he's using the term in a self-deprecating or ironic way. But within days of noticing this, I was told that the legal writer and style-guide author Bryan Garner had referred to the linguist John McWhorter as an ultracrepidarian. Garner definitely was using it in a negative way. To be honest, most people are probably ultracrepidarians. I mean, we all gift the world with our judgments about politics and economics and (ahem) language usage, but realistically, most of us are not experts on these things. Obviously, we aren't usually going to label ourselves as ultracrepidarians (Banatt notwithstanding), but it seems like a useful term to keep handy when someone else seems to be talking through their hat. So, funny story about the origins of this term. It consists of ultra ("beyond") with crepidam, a classical root referring to shoes or the soles of shoes. 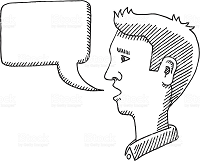 Per one dictionary, the term originates with Pliny the Elder's phrase ne supra crepidam sutor judicare ("let the cobbler not judge above the sandal"), i.e., don't blather about things you are not qualified to discuss. The term has been in English since at least 1819, which should have given me plenty of time to have heard it by now. And that isn't even today's unexpected word origin! From a Facebook post this week I learned the origins of the word janitor. Etymologically speaking, a janitor is a "door guard," from Latin janua, meaning "door" or "entrance." 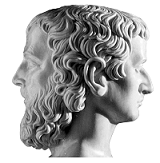 Here's the fun part: janua is related to the name Janus, the two-faced god of doors, gates, and other portals. And! Janus was also associated with change and transitions ("When one door opens …"), which is how we ended up with the name of our first month: January. This was all very satisfying to me.